Well, this is the moment fellow Harry Potter fans have been waiting for: the second Fantastic Beasts movie: The Crimes of Grindelwald. Now we see the continued adventures of Newt Scamander and the evil schemes of Gellert Grindelwald. So how was it? Honestly, not as good as I was hoping. I believe J. K. Rowling fell into the same trap in writing this film that she did in Order of the Phoenix and parts of Deathly Hallows: trying to do too much at once. The storyline was cluttered with too many extraneous elements. Not to mention all the continuity problems she introduced. I feel like this movie needs a bit more of a detailed treatment, so in the style of my review of The Last Jedi, let’s break it down. Jude Law/Albus Dumbledore. 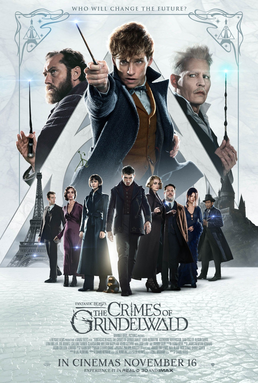 Jude Law was great as Albus Dumbledore. Aside from his radically different fashion sense from Old Dumbledore, he really nailed it, and it definitely felt like he could be the same character. Being 70 years younger than the Dumbledore we knew, this version talks a bit faster and is a bit more emotive, but thankfully not anywhere near “Did yah put yah name in da Goblet of Fiyah? !” levels. Rather, it was a believable young Dumbledore. I especially liked how J. K. Rowling didn’t shy away from showing his manipulative side in convincing Newt to go to France (potentially risking prison time), and better yet, how the mess in New York was also a setup of Newt by Dumbledore from the start. Rather than shielding Newt like he did the child Harry, this Dumbledore almost revels in it because Newt is an adult who can handle it, and I think that’s actually very true to the character. Johnny Depp/Gellert Grindelwald. Johnny Depp’s casting as Grindelwald was controversial for two reasons: first because of domestic abuse allegations against him by his ex-wife, Amber Heard, and second because of the “Oh, no, are we going to get Jack Sparrow-Grindelwald?” factor. I can’t speak to the first, but as to the second, no, we didn’t! Johnny Depp was back in top form in this movie. He portrayed Grindelwald as a mostly-serious, very powerful villain with his own distinct look and mannerisms. And more broadly, Grindelwald was brilliantly written. Not only is he a villain with interesting and believable motivations, if we didn’t have the foreknowledge that he’s a wizard fascist, it might not be so clear that he’s truly worse than the oppressively segregationist Ministries of Magic he opposes. What’s more, the fact that he foresees a prophecy of World War II, the Holocaust, and the atomic bomb and wants to prevent it makes him a borderline anti-villain (and probably one who still agrees with Dumbledore more than he disagrees). I look forward to see where his character is going. Nagini. Completely pointless. She barely did anything. It would have made more sense for her to join Grindelwald in hopes of finding a cure for her Maledictus curse. Minerva McGonagall. She wasn’t even born yet, and no, there’s no other relative she could be. Her father was a muggle, and her mother kept magic a secret from him until Minerva was born in 1935. There was no McGonagall at Hogwarts in 1927. Queenie’s betrayal. I actually thought this was a good subplot, but it was handled really badly. Queenie should have had a dramatic scene where she tried to persuade Jacob to join Grindelwald’s cause based both on them being able to marry under his new regime and on preventing the next World War that Jacob fears. Instead, she just asks him to come with her, he calls her crazy without trying to persuade her back, and that’s it. A little more exposition of her slow-moving mental breakdown could have helped set it up better, too. The Blood Pact. On one hand, I thought this was a really clever plot device. Dumbledore being haunted by the demons of his past felt like a thin excuse in Deathly Hallows for not confronting Grindelwald sooner, and much more so now that we know the shadow war between them was going on for nearly 20 years before their final duel. That they made a magical blood pact not to fight each other in their youth works a lot better…except that they already fought each other once. In the duel that killed Ariana. I feel like we’re missing something here. Magic is ridiculously powerful now. Dumbledore creates fog throughout what looks like all of London with a casual wave of his wand—and he doesn’t even have the Elder Wand yet. Grindelwald’s blue fire—which is not Fiendfyre but supposedly a dark shield spell—could burn down all of Paris. I thought magic was getting overpowered in the last movie when a couple dozen Aurors repaired half of New York in a few minutes, but it’s only gotten worse since. If Voldemort had that kind of power, the Battle of Hogwarts should have gone very differently. It’s so different that from the books that I’m starting to think J. K. Rowling might be working on a separate “book canon” and “movie canon” rather than a singular Wizarding World. There’s more I could say here, but I have a Wizards v. Muggles post that I’ve been sitting on for a while, and I think it’s time to write it up with our new information, so stay tuned. Aurelius Dumbledore. What the heck? There is so much weird stuff going on here, including multiple problems with the timeline, that it would need its own post to get through it all, but the upshot is that there is no good way to fit another Dumbledore into the timeline. Either Grindelwald is lying, including faking the phoenix (Fawkes, anyone? ), or something even weirder is going on here, and I’m worried J. K. Rowling might really jump the shark trying to write her way out of this one. Honorable mention: Fawkes didn’t come to Albus Dumbledore because he had a good soul or performed some noble deed, but just because he likes his family? That just feels wrong. It takes away some of the merit Albus should have had in these films, and it feels kind of like Solo: answers no one wanted to questions no one was asking. This entry was posted in Movie Reviews and tagged Fantastic Beasts, Fantastic Beasts: The Crimes of Grindelwald, Harry Potter, J. K. Rowling. Bookmark the permalink.